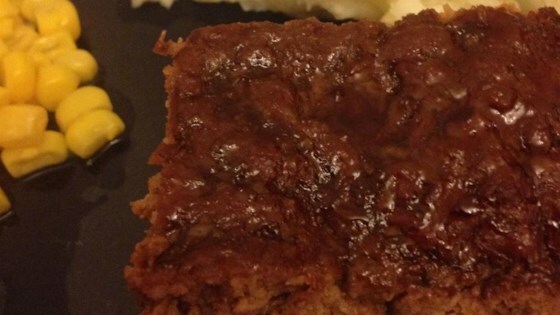 "A great meatloaf that is easy to prepare. It is very yummy. My husband asked me if I'd remember how to make it. I said no, so he made me write down how to make it so I wouldn't forget. My picky 4-year old likes it." Preheat oven to 350 degrees F (175 degrees C). Lightly grease an 8x8 inch baking pan. Melt the butter in a skillet over medium heat. Stir in the onion, honey, ketchup, soy sauce, and hot sauce. Cook and stir 5 minutes, until onion is tender. In a bowl, mix the onion mixture with the ground beef. Transfer to the prepared baking dish. Bake 1 hour in the preheated oven, or to an internal temperature of 165 degrees F (70 degrees C). Discover the simple secrets to amazing, beefy meatloaf. very bland, not a good recipe, texture was not to our liking. Excellent!!!! Have made several times and my family loves it. I almost left out the hotsauce, but it gives great flavor and does not make spicy. Yum. This was so good! It looked a little funny, but the taste was delicious! Wife liked it enough to take for work lunch day after and called home to say how much she liked it. Three sons swarmed it. I liked the technique for this but it was very bland. I will make it again with more seasoning.